Looking at my stats for that post indicates that the interest for cooking rabbit must be fashionable at the moment. Is it because we are close to Easter and some in Australia consider rabbit to be a suitable Easter dish? Chicken recipes seem also to be popular at Easter. If Italians are going to cook at home, they are more likely to cook spring produce – lamb or kid, artichokes, spring greens and ricotta is at its best. If you live in Ragusa, Sicily, you are more likely to have a casual affair with family and friends and eat scacce or impanate – vegetables or vegetables and meat wrapped in oil pastry (see links at bottom of this post). This is a common Italian saying that seems appropriate for Australia as well. Natalie con I tuoi, Pasqua con chi voi. Christmas with yours (meaning family) and Easter with whom ever you choose. There are several recipes for cooking rabbit and hare on my blog. There are also recipes for cooking chicken and I have chosen to list the chicken recipes that would be suitable to cook as chicken or to substitute the chicken with rabbit. If you are substituting rabbit for a chicken recipe, cook it for longer and you may need to add more liquid during the cooking process. POLLO OR GALLINA ALLA CONTADINA, ALLA PAESANA – BRAISED CHICKEN WITH OLIVES, SICILIAN STYLE. I used Hapuka, but any fish will do. The Sicilian flavours are simple – grated lemon peel, lemon juice, anchovies, fresh mint and parsley. Once you have pan fried one side of the fish, turn it over, top with the chopped herbs, anchovies cut into small pieces. Wait till the underside is cooked to your liking – do not overlook it as the fish will be flipped on the same side again for a very short time. Turn the fish over once again and salt that side slightly and add lemon juice. Evaporate the lemon juice and it is done. The anchovies should have “melted” a bit. An important ingredient for making Pasta con le sarde is wild fennel. The season for wild fennel has well and truly passed and all you will find at this time of year are stalky plants, yellow flowers/ seed pods and no green fronds. What we call Florentine fennel is also going out of season and you will find for sale specimens with very small stunted bulbs. If you are lucky, your greengrocer may sell them with long stalks and fronds attached – perfect to use as a substitute for wild fennel and I certainly would not go near these stunted specimens otherwise. Sardine fillets are easy to find. I use the paper that my fishmonger has wrapped the sardines to wipe dry the fish. Remove the small dorsal spine from the fillets. Once again the paper comes in handy to wipe fishy fingers. Sardine fillets, chopped spring onions, the softer green fonds of the fennel, saffron soaking in a little water, currants soaking in a little water, fennel bulb cut finely, toasted pine nuts and chopped toasted almonds, salt and ground black pepper (or ground chili). The preferred pasta shape are bucatini, but spaghetti or casarecce are good also. You will also need some breadcrumbs (made from good quality day- old bread) toasted in a pan with a little oil. Add a bit of sugar, some cinnamon and grated lemon peel. toss it around in the pan so that the sugar melts and the flavours are mixed. This is the topping for the pasta. I have seen this referred to as pan grattato – this would not be my preferred tag – in Italian pan grattato is the term for plain breadcrumbs, but I accept that over time the terminology has evolved. The traditional Sicilian breadcrumb topping would not have had/ does not have the cinnamon or grated lemon peel. The larger fennel fronds and stalks are used to flavour the water for the cooking of the pasta. Place them into salted cold water, bring to the boil and simmer for at least 10 minutes – you can leave the fennel in water as long as you like. The greenery can easily be fished out with tongs before the pasta goes into the boiling water to cook. And then it is a very simple matter of cooking the ingredients. Sauté the spring onion in some extra virgin olive oil. Add the fennel and chopped fronds and sauté them some more. Depending on the quality of the fennel (degree of succulence) you may need to add a splash of water or white wine, cover it and continue to cook it for a few minutes more. Add salt and pepper and put the sautéed vegetables aside. Fry the sardines in a little extra virgin olive oil – they will cook very quickly and begin to break up. Combine the sardines with the cooked fennel, add saffron and drained currants and mix to amalgamate the flavours. Add the almonds and pine nuts. Dress the cooked pasta with the sardine sauce. Put the dressed pasta in a serving platter and sprinkle liberally with the toasted breadcrumbs – these add flavour and crunch to the dish. Citrus fruit is grown extensively in Sicily and citrus groves are found throughout the island region. Apart from different types of oranges (including the blood oranges) there are mandarins, tangerines, lemons, cedri (citrons) and limette (Sicilian limes). Sicily is one of the world’s largest producers and exporters of citrus especially of lemons; the climate fosters a long, growing season and the harvesting of different varieties of lemons over three distinct periods in the year. Lemons are extensively used in Sicilian cuisine – fresh lemon juice and the rind (or grated zest) are added to savoury or sweet dishes to balance and enhance flavours and even the leaves are often used in between pieces of meat or fish to add flavour. Lemon juice is often used in marinates and to avoid discolouration of fresh fruit and vegetables (for example in fruit salads or when cleaning artichokes). Lemons are used profusely for making drinks, liqueurs, essences, jams and marmalades. Candied or preserved peel is used significantly in Sicilian pastries and confectionary (for example in cassata and cannoli). Used also and mostly in Sicilian pastries is cedro (citron). This citrus fruit grows in Sicily ​​(and Calabria); the fruit is large and spherical with a thick wrinkled skin that turns from green to yellow during ripening. It has a strong fragrance and flavour, even stronger than lemons. The thick peel is candied and the fruit and peel is used to make a sweet paste also used in Sicilian patisserie. Sicily benefits greatly from the production of lemons. Lemons have anti-bactericidal and antiseptic qualities; they are known for their therapeutic properties and are therefore beneficial in aromatherapy, pharmacology and medical and scientific applications. The essential oils are prominent in perfumes and the cosmetic industry. They are also widely used in cleaning products and citric acid (derived from lemons) is used extensively as a preservative. The flowers and leaves are used for ornamental purposes. The white and pale violet blossoms have a strong and appealing scent and are often used in bride’s bouquets and inserted in button holes in men’s jackets at weddings. When Sicilians (and other southern Italians) came to Australia, one of the first thing they planted was a lemon tree. Many are grafted to produce different types of lemons or different citrus. You may be familiar with making Sicilian orange salads (especially with blood oranges), but you may not have considered enjoying a Sicilian lemon salad. 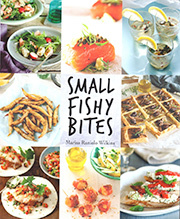 I particularly like serving a lemon salad as an accompaniment to grilled fish, especially sardines. Last time I made one I presented it to accompany a meat terrine made with pork. Use large, mature lemons – the larger, the more pith, the better. Many of the large lemons are more round in shape. You will be amazed by the sweetness of the lemon in the salad. The use of salt will make the lemons taste sweeter (just like balsamic vinegar brings out the sweetness of strawberries). Peel the skin off the lemons with a potato peeler, leaving as much pith as possible. Cut the lemons in half and squeeze out some of the juice (otherwise the salad will be too acidic). Cut the lemons into quarters and then into slices or manageable chunks (slices cut into four). Remove any pips. Add finely chopped parsley or mint. Dress with extra virgin olive oil, freshly ground pepper and salt. Sea urchins are messy to clean and you may feel cheated when find that not all of them are as endowed of gonads as the others, but they are worth it. Use scissors and place the sea urchin face up. To extract the gonads (this is what we eat), enter through the mouth and cut around the top of the urchin with scissors. Wear thick gloves. The gonads of both male and female sea urchins are usually referred to as ‘roe’ or ‘corals’ and they can vary in colour from yellow- orange to light brown. Lift off what you have cut and do not be put off by the amount of “black gunk”. Pour out the black liquid and discard. Use a small coffee spoon or tweezers to extract the roe. Use the tweezers to pluck any residue black matter. I like to eat them with a sauce on some bread. It is the same sauce that I use to make Spaghetti con Ricci – Spaghetti with Sea Urchins. Breadcrumbs are called Pangrattato (grated bread) in Italian. Mollica is the soft part of the bread with crusts removed but in the culinary world both pangrattato and mollica have acquired new significances and have been enhanced. Both refer to breadcrumbs lightly toasted in in olive oil, herbs and seasonings and variations include anything from garlic, red pepper flakes, pine nuts, anchovies, lemon zest , cinnamon or nutmeg, salt and a little sugar. When I make pangrattato I store left overs in a jar in my fridge and use it to enhance other dishes: this time I used it to stuff fennel. For moisture and extra flavour I added a little ricotta and a little grated cheese – pecorino or parmigiano. Cut the stems off the fennel and remove the toughest and usually damaged outer leaves Cut the fennel into quarters. Cook the fennel in salted water, bay leaves salt and lemon juice for about 10 minutes until it is slightly softened. Remove it from the liquid and cool. Make the filling: Work the ricotta in a bowl with a fork, mix in the pangrattato and grated cheese. Prise open the leaves of the fennel and stuff with the pangrattato stuffing. Place the quarters into a baking bowl that allows them to stay compact and upright (like when you are cooking stuffed artichokes). Sousing fish was a way of preserving it before refrigeration by saturating the fish with acid – vinegar in this case which, like salt, prevents the growth of microbes. Sugar is also added and to create an agro dolce dish (sweet and sour). The fish is first fried in olive oil and then marinaded in the vinegar base. Slowly sautéed onions are a common ingredient in soused fish and different flavourings are added to the pickling mix. My Sicilian grandmother would put mint, bay leaves and slivers of garlic in her vinegar marinade (pisci ammarinatu in Sicilian), but the pesse in saor made in Venice and in Trieste where I lived as a child, has raisins and pine nuts in it. Pesse is Triestiane for pesce – fish in Italian. Soused fish is found all over Italy, for example pesce alla scapace is cooked in central and southern Italy and the Molise version is flavoured with saffron, minced garlic and sage. Pesce in carpione from Lombardy has celery and carrot for flavourings, the Ligurian scabeccio has garlic, whole pepper and rosemary, and the Sardinian marinade has chilli, garlic, and tomato sauce. Soused fish is also common in other cultures – Nordic countries thrive on soused fish and different versions of escabeche are found in Spanish, Portuguese, French and in North African cuisines. I have a German friend who also cooks soused fish – he adds coriander seeds to his. My maternal grandmother always had soused fish (in pottery terrines and covered with plates as lids) in her kitchen in Sicily. When she visited us in Trieste she did the same and our kitchen then also smelt of fish and vinegar. She particularly liked to souse eel – eel was good in Trieste. We would walk to the Pescheria together, she would choose the eel she wanted from a big tank and the fishmonger would kill it and chop it into pieces. I did not much like this part, but I liked going to the Pescheria on the waterfront in the bay of Trieste. The imposing building is now home to Eataly. Triestine pesse is mostly made with sardines and is often eaten with white polenta (yellow polenta is usually an accompaniment to meat). 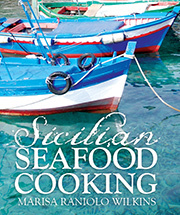 Traditionally, the fish is lightly dusted with flour and salt before it is fried in very hot, extra virgin, olive oil. Although the flour helps to hold the fish together, the oil used to fry the fish will need to be discarded (the sediment will taint the taste of the oil) and the flour coating will often come away from the fish in the marinade. On my way to Adelaide from Melbourne I drove through Meningie (at the northern end of the Coorong on the shores of Lake Albert) and I bought freshly-caught Coorong mullet. On this occasion I used them instead of sardines to make pesse in saor. 2-3 fish per person /12-16 fresh sardines or small fish (sand whiting, mullet, garfish, flathead, leather jackets), cleaned and filleted with heads and backbone removed. Dust the fish fillets in a little flour and salt, shake off as much flour as possible and fry them in plenty of oil until golden and crisp. Place them on kitchen paper to remove excess oil and set aside. Soak the raisins in the white wine for about 30minutes. Sauté the onions gently in some olive oil until they are soft. Add the vinegar and pepper and cook the mixture for a few minutes. Set aside. Select a terrine deep enough to hold the fish, ingredients and vinegar marinade – a narrow, deep terrine is best. Place a layer of fish, add some onions (dig them out of the vinegar mixture), raisins (drained) and pine nuts. Continue layering the ingredients, finishing with a layer of onions, raisins and pine nuts on top. Pour the vinegar over the layers. Cover it, place it in the fridge and allow to marinate at least 24 hours before serving. Serve at room temperature. I recently made Pasta alla norma and although this post was first posted on May 4, 2012 and I am posting it again on 25th April 2018. Ripe tomatoes and eggplants continue into autumn and although the basil may have finished, fresh mint leaves add an interesting fresh taste to the dish. Pasta alla Norma is one of those dishes Sicilians are extremely fond of especially in late summer when the tomatoes are ripe, the basil is abundant and the eggplants are at their best. There are some summer pasta dishes which call for uncooked, ripe tomatoes and when possible I try not to substitute tinned tomatoes for Pasta alla Norma. All it is = a salsa of fresh tomatoes, short pasta (caserecce are good) and fried eggplants – usually cubed and added to the pasta once it has been dressed with the tomato salsa. Ricotta salata tops it all off. Easy stuff. Failing ricotta salata, use a strong pecorino cheese… both these cheeses are preferred by Sicilians; parmigiano is the preferred cheese in Northern Italy. The dish originates from Catania, the city that my mother’s family comes from. Many presume that the dish is named after the opera, La Norma, by the composer Vincenzo Bellini who was born in Catania (1801-1835), but there are others who think that the expression ‘a norma’ (in Sicilian) was commonly used in the early 1900s to describe food that was cooked true to form (i.e. as normal, as it should be) and according to all the rules and regulations specified in the recipe. I ate a version of Pasta alla Norma in a seafood restaurant in San Leone (on the coast, near Agrigento). The tagliatelle were presented on top of half an eggplant, (that had been cut in half and then fried). The sauce also contained a few currants and a few anchovies, thin slices of bottarga (dry, salted tuna roe) and cubes of ricotta salata on top. It does look very spectacular, but if you intend to do this, and are using a large round eggplant, cut the eggplant horizontally and remove a slice from the centre of it to make it thinner – the eggplant will cook more evenly. Follow the recipe below and to the salsa, add a tablespoon of currants and a couple of chopped anchovies. In Sicily bottarga is salted, cured fish tuna roe rather than bottarga made with grey mullet as common in Sardegna (Sardinia). Remove the stem end of eggplant and without peeling and slice or cut into cubes. I do not usually salt my eggplant; sometimes I briefly soak it in salted water so that the eggplant does not absorb as much oil. Pat-dry the eggplant and fry in 1 cup of olive oil until golden. Drain on paper towels. Make the tomato salsa: place the tomatoes in the pan with garlic, oil, salt and some basil leaves: cook uncovered on medium heat till it is thick. Mix the pasta with the tomato sauce, place in a large serving bowl and top with the eggplants and the remaining basil (or mint). Present with grated cheese, preferably ricotta salata. Culturally In Australia Easter is no big deal, however in Italy it is tied to religious observances and fish is traditionally eaten on Good Friday by Italian Catholics even if they are not practising Catholics. I plan to cook something simple – a pasta dish with Mussels. Cozze in Italian, cuzzili in Sicilian. This is not a complicated dish. It is made with fresh mussels and a little fresh tomato, but not so much to mask the taste of the other ingredients. Local mussels are prolific in Victoria and I regularly buy them at the Queen Victoria Market; these are generally farmed in Port Phillip Bay and recently from Mount Martha; when I get the chance, I like to go to Portarlington, where they are sold straight off the boats. Mussels are sustainable. Red, ripe tomatoes are fabulous at this time of year, but tinned tomatoes are OK too. I even used some ripe, yellow, heirloom tomatoes in this sauce! Spaghettini (thin spaghetti) are used for this dish – the thin strands result in a greater surface area and allow greater absorption of the sauce. The sauce is prepared quickly while the pasta is cooking. The same ingredients and method of cooking this dish can also be used with other fish – try squid. Do not be horrified and think me a phony for using grated cheese with fish! The rest of Italy may not, but Sicilians do it. Using cheese is not necessary, especially if you like to savor the fresh taste of the tomatoes. Clean the mussels by rubbing them against each other in cold water (or use a plastic scourer). Pull the beards sharply towards the pointy end of the shell. Heat 2 tablespoons of olive oil in a deep pan. Cover and cook over a brisk flame, shaking the pan every now and then, until the mussels have opened. Turn off the flame and let them cool slightly, then remove and discard the shells of about ¾ of them. Use the whole mussels for decoration. If you have given the mussels sufficient time to open and some have remained closed, there is no need to discard them. They are very much alive, place them back on heat and they will eventually open. Save the juice from the mussels in a separate vessel. Add the onion to a new pan, sauté till golden. Add the chopped tomatoes and some basil stalks with leaves attached (these can be removed at time of serving). Simmer the sauce for about 8-10 minutes, just to blend the flavours and to evaporate some of the tomato juice. Place the tomato sauce aside. Add some extra virgin olive oil and garlic to a new pan (or wipe down the same pan that you have used to cook the sauce). Soften the garlic and add the parsley. Add the mussel meat to the pan and toss the ingredients around for a few minutes before adding the tomato sauce and as much of the mussel juice as you think you will need for the sauce. Remove the cooked basil (it has done its job). Add the mussels in their shells (gently) to warm through. Drain the pasta. Add it to the pan with the rest of the ingredients toss them around till they are well coated. Be gentle with the cooked mussels in their shells as you want to keep the mussel meat in the shell. Present with grated cheese for those who wish. Pasta with cozze is eaten all over Italy but in Northern Italy parsley and garlic are the preferred flavourings and no tomatoes.